In the Westfjords of Iceland, people wait for birds to come ashore so that they can gather the feathers they leave behind. These birds, called Eider Ducks, are the source of eiderdown, a ridiculously expensive and rare stuffing for bedding. This has landed the Arctic Fox in the crosshairs (quite literally). These relatively common foxes are opportunistic eaters who snack on eider ducks if they get the chance. Icelandic Language documentary on the production of eiderdown. An Arctic Fox (vulpes lagopus). So the Icelandic government placed a bounty on each fox killed (if you can provide its tail as proof). Hunters of the Westfjords set up elaborate baiting ambushes for the foxes, and wait in darkened houses with rifles in the middle of blizzards. The taxidermied body of “Tripod”, a three-legged fox. Pictured here carrying the body of a seabird (a razorbill). But some foxes are smart enough to outfox the hunters. 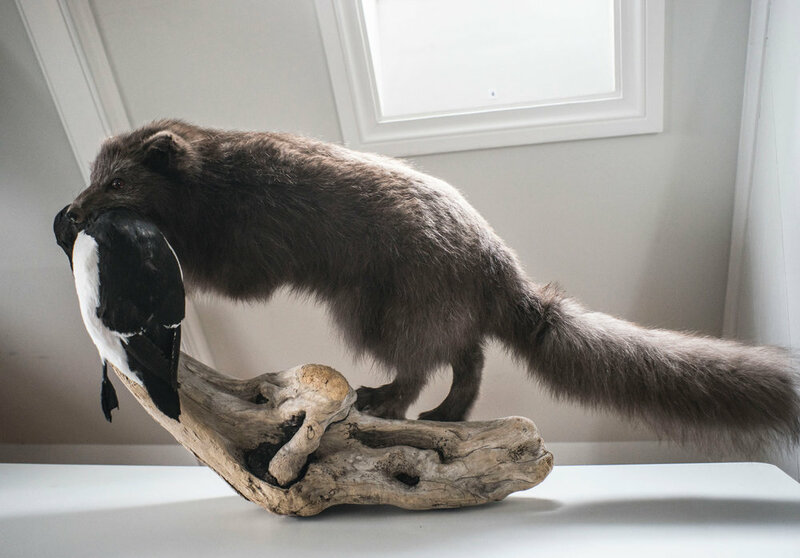 Megan Perra heard a rumor of a three legged Icelandic fox named “Tripod” that beat the odds. A fox that grew to almost twice the normal size from stealing food from traps for three full years (or so the legend goes). Megan is an illustrator/journalist from Portland, Oregon, and she’s currently working on a video documentary about the foxes’ interactions with humans. Megan retraces the steps of Tripod, from his birthplace in the Westfjords, to the lab in southern Iceland where he was dissected, and to his current home in a glass case at the Arctic Fox Centre. She visits a rural gas station where she finds Jóhann Hannibalsson, the hunter who finally shot Tripod after years of trying. The two of them go on a snowmobile ride that brings them to a cabin where, in the dark, Megan witnesses Jóhann’s version of a fox hunt. Along the way, Megan also speaks to Ester Unnsteinsdóttir (a fox researcher), Siggi Hjartarson (a hunter), Stephen “Midge” Midgley (Manager at the Arctic Fox Centre), and Þorvaldur “Doddi” Björnsson (the taxidermist who preserved Tripod’s body). An Icelandic hunter, Jóhann Hannibalsson, at a remote cabin where he intends to shoot a fox. Megan Perra produced this episode. Jeff Emtman edited with help from Bethany Denton. All visuals accompanying this episode are courtesy of Feral Five Creative Co / Megan Perra. In other news, if you live in the Boston area, and would like free shipping on our HBM Meat Poster, Jeff will deliver you one on his bike (while supplies last). Just purchase the poster as usual, then we’ll refund you the shipping cost. Feel free to contact us if you’d like to know if the offer’s still good or to see if you live within delivery range.